The past few months - and especially the past few days - have exposed a stark contrast in South American football. All the evidence points to the conclusion that, in global terms, the continent's national teams are extremely strong - while the club sides are alarmingly weak. First the good part. Moving into World Cup year, the South American nations are generally considered to be amongst the favourites - and not just because they will be playing the tournament on home soil for the first time since 1978. South Africa 2010 revealed the continent's contemporary strength in depth, and there has been plenty more proof in 2013. The blend that Brazil have found over the past six months would make them strong World Cup contenders wherever the competition was being played. Argentina can count on a dazzling array of attacking firepower. Chile showed their quality with their win at Wembley - and only a stoppage-time equaliser stopped them beating Spain in a match staged in Switzerland. Colombia have just won away to Belgium and held Holland. Ecuador are often dismissed as mere altitude specialists. But earlier this year they won away to Portugal. 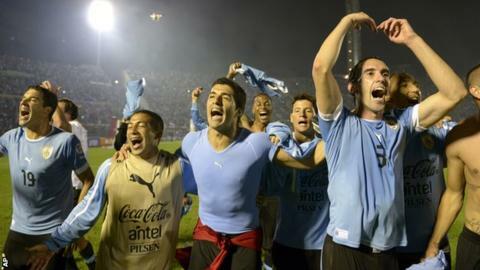 Uruguay may have finished fifth in South America's qualifiers, and needed a play-off to reach the World Cup. But the same thing happened last time round, when they went on to reach the 2010 semi-finals - and since then, if many of the team have grown old together, their strikeforce of Luis Suarez and Edinson Cavani have come into their footballing peak. Perhaps the most astonishing display of South America's strength in depth came a few months ago when Paraguay, who finished bottom of the qualification table, travelled to Germany and came away with a 3-3 draw. There could be no clearer indication that there are no easy games in the South American qualifying process. Those who make it through are battle-hardened and ready to take on the best the planet can throw at them. But that is something Atletico Mineiro, the continent's champions, were clearly unable to do in the recent World Club Cup in Morocco. Atletico's level of performance was frankly very poor. They lost 3-1 to Raja Casablanca in the semi-finals, then secured third place when a last-minute goal gave them a 3-2 win over China's Guangzhou Evergrande. But the Asian champions were unlucky; they were denied a clear penalty, and there was a strong suspicion of offside about Atletico's winner. For much of the game, Guangzhou were simply the better side. Indeed, in terms of level of play, Atletico were probably only the fifth best team on show in the competition, losing out as well to Monterrey of Mexico. And yet this team were the legitimate champions of one of football's big two continents. So why the huge discrepancy between the relative strengths of club and country? A large part of the explanation is obvious - it is a consequence of the globalisation of the game. South American football has become an export industry, and so the continent's best players, while available for the national teams, spend their peak years with European clubs. This, of course, cuts both ways. It is only since the last World Cup, for example, that many around the globe have finally realised that, with so many foreign players, the strength of the Premier League does not necessarily translate into a top-notch England team. Over recent years there has been a significant increase in the revenues of Brazilian clubs - and Brazil has supplied the past four South American champions. This development has by no means levelled the financial playing field between Brazil and the top European clubs. But it has altered the balance a little. On the field, though, the gap looks wider than ever. All four of those teams spent months eagerly awaiting the World Club Cup - over here it is considered the highlight of the club calendar. Only one came back with the trophy, and there was nothing heroic about the defeats suffered by the other three. For Internacional in 2010, Santos the following year, and now for Atletico, participation brought more humiliation than pleasure. The exception was Corinthians last year. True, there is always a danger of reading too much into a short competition, especially one still striving for credibility such as the World Club Cup. And Corinthians had the good fortune to meet Chelsea, the least convincing European champion of recent times. Even then, they needed an inspired performance from keeper Cassio to win. But it also seems clear that Corinthians had one vital advantage over their compatriot clubs; they had a model of play that equipped them for the challenge. Corinthians were not a defensive side. But they were defensively solid. Their coach Tite, based, as he told me recently, on hours well spent on the training ground, managed to construct a side that were compact, and difficult to play through. The contrast with Atletico this year could not be clearer. In a competition where the champions of all the continents were present, Atletico's defensive line appeared to be on a different land mass from the attack. There were gaping holes between the lines of the team, all too inviting for the opposing attack. For their own self-esteem, it is probably just as well that Atletico lost their semi-final and avoided a meeting with Bayern Munich. It is much more, then, than a case of mere finance. It is also all about the idea. Bayern's success makes it apparent just how good the Barcelona years have been for European club football. Barcelona triumphed with an idea of play. And since winners are copied, that idea has been dissected and many of its tenets incorporated - Bayern were doing so even before they hired Pep Guardiola. The best contemporary European clubs have the top players from all over the world, and a coherent, constructive, collective idea of play. The South American clubs, with the exception here and there, are muddling through. Once the best in the world, South American club football now stands waiting for the great leap forward. What influence? I think that Scolari has come to the conclusion, like the two Brazil coaches before him, that from open play Ronaldinho can no longer exert much influence on a top level game. It was the stand Scolari took on Romario in 2002, and I'm pretty sure it will be repeated this time. Not that there is much of a clamour for his inclusion, and any remote chance he had has surely gone with his performances in Morocco. Those superb free-kick goals speak volumes about the extraordinary talent he has. But the way he waddled round the periphery of both matches tells us just as much about how, for seven years now, that talent has been wasted.